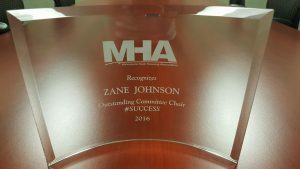 Congratulations to Zane Johnson on Winning MHA’s “Outstanding Committee Chair” for 2016! | Rental Research Services, Inc. Rental Research Services wants to extend a huge congratulations to our own Zane Johnson for winning the Minnesota Multi Housing Association (MHA)‘s “Outstanding Committee Chair” award for 2016!